The civil unrest in Burundi has led to an outflow of over 210,000 refugees (as of 31 October 2015) to neighbouring countries of the Democratic Republic of the Congo (DRC), Rwanda, Tanzania, and as far away as Uganda and Zambia. It started in Bujumbura in April 2015, with a peak in June, ahead of the contested Presidential election that took place on 21 July 2015. Since then, a tense political crisis and a climate of fear and intimidation have spread throughout the country. The worsening situation led to the declaration by UNHCR of an L1 emergency on 22 April, and an L2 emergency on 11 May 2015. A Regional Refugee Coordinator was also appointed to coordinate the response. 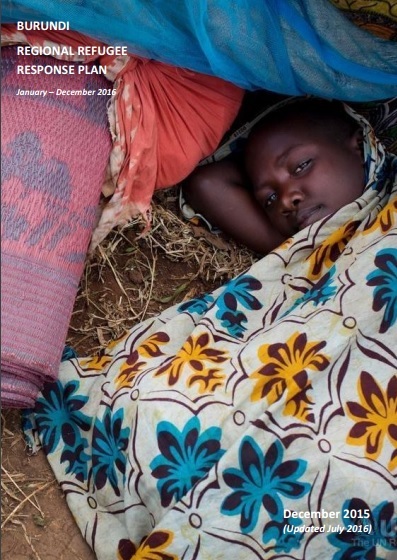 To ensure a coordinated response to the protection and assistance needs of the Burundian refugees in the region, a Regional Refugee Response Plan (RRRP) was launched in May and then revised twice, in August and October 2015, as the situation in Burundi remained very volatile despite the conclusion of the electoral process with the contested re-election of President Nkurunziza for a third term in office. While the influx of new refugee arrivals has somewhat slowed after June, there has been a shift in reasons for refugee movements. While many refugees cited fear of post-election violence in early 2015 an increasing number of refugees have cited human rights violations including against freedom of expression in the second half of the year. Even more worrisome, the security situation has lately deteriorated further: on 10 November, the UN Human Rights Office reported that at least 240 people have been killed in Burundi since 26 April 2015, including 15 children. The killings include the close range shooting on 13 October in Bujumbura of nine people, including an IOM staff and a cameraman for Burundi State radio and television, his wife and two teenage children in their home. A week later, a UNDP national staff was killed when armed men attacked a bar in Bujumbura. There has also been a rise in inflammatory speeches, raising heightened concerns that the situation within Burundi will significantly deteriorate further. This prompted, on 12 November, to the unanimous adoption by the UN Security Council of Resolution 2248 (2015), which, inter alia, strongly condemns human rights abuses and violence, calls for the respect, protection and guarantee of all human rights and fundamental freedoms for all by the Government, and urges the latter to support the mediation efforts; finally, it expresses its intention to consider additional measures against those perpetuating violence and impeding the search for a peaceful solution. While levels of refugee reception and delivery of protection and assistance were significantly raised in all countries of asylum, the current needs of refugee women, men, girls and boys have only been partially met. Governments in countries of asylum continue to be in need of strong support by humanitarian actors to address the current and evolving needs of Burundian refugees for an extended period of time. This is why this new Regional Refugee Response Plan will cover the period from January to December 2016.